Downloading the Aadhaar card with the help of enrolment number is quite simple. In case you do not know you Aadhaar Number, you can also download the Aadhaar card using the enrolment number. The enrolment number is mentioned on the enrolment slip given to you at the time of registration. You need to follow the following steps to download the Aadhaar card using the Enrolment number. Step 1: To Download the Aadhaar Card using the Enrolment number, you would require navigating to the government’s UIDAI Website. The best way to access the website here https://eaadhaar.uidai.gov.in/. If for some reason, you are unable to access the website by clicking on the link mentioned above, you can simply copy and paste the given link in the address bar of the browser. Step 2: The next step is to click on the radio button which is corresponding to Enrolment ID. 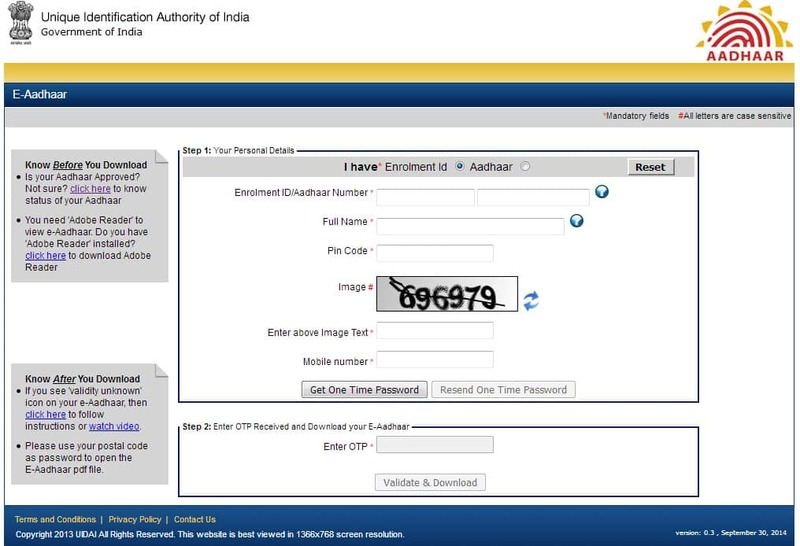 This will load the relevant form for downloading the Aadhaar card using the Enrolment ID. Once the form loads, you would have entered the 14 Digit Enrolment ID which is mentioned on the enrollment form. In the corresponding column, you would require entering the timestamp from the Enrolment Slip in the exact format. The next step is to enter the Full Name and the Pin Code of the Aadhaar card holder. Ensure that there is no spelling error in the name as the data will be validated from the database and if there is a spelling error, you would not be able to download the Aadhaar card. Now, for the security purpose, entered the Captcha Code in the relevant column. In the next column, you would require adding the mobile number of the person and the mobile number should be same as the mobile number provided at the time of Aadhaar registration. Once you have entered the mobile number, you can go ahead and click on the button to Get One Time Password. This will trigger an OTP generation and the password will be sent to you on your mobile number. After you receive OTP, you can simply enter the OTP in the box given below and in the next step you would require clicking on Validate and Download Button. After clicking on the button, wait for a couple of seconds and the Aadhaar card would be saved on your computer. You can open and print the PDF file. It is in the best interest to get the Aadhaar card laminated so that the card be secured and any damage to the Aadhaar card can be avoided. Also, to access the Aadhaar Card, you would require entering the Pin Code in the PDF File as the file would be password protected. Aadhaar card can be downloaded easily by following the steps above, if in case there is some discrepancy in the information mentioned on your card, you can update the details by visiting here https://ssup.uidai.gov.in/web/guest/ssup-home.